This is a great laser for daytime use. Super bright and visible for very long distances. I use this most work days, and probably more than any other tool I carry. I've had others ask about the laser, and have recommended Dragon Lasers many times. 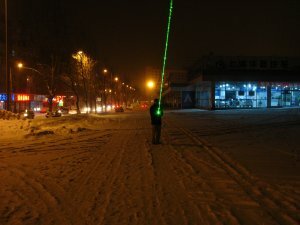 I know some others who have bought these lasers as a result and use them for their work too. I am the owner of a viper laser pointer. The girls loves it my friends loves it everybody loves it. After receiving 200mw Spartan I was surprised by its stunning green beam. Thanks to dragonlasers for this laser. It's really solid-looking laser. For those who want good green laser, this is a perfect choice. But be sure to purchase safety glasses for it. I love this tool. I use it daily for pointing out specific branches to address on my customer's trees. As a handy aside this laser helps me drive away the flocks of Canada geese that graze/poop,graze/poop on our waterfront. I purchased a 532nm Viper @ 55mW from Italy and not only the product (which I knew was high-quality), but especially the customer service far exceeded my expectations. The product itself is really sleek and portable despite the moderately high power for being pen-style, the materials are luxury and the optics really well-crafted. Highly recommended for star-pointing at public events and even for self-experimentation (if you know what you are doing!). As far as the customer service is concerned, they handled with great assistiveness and helpfulness the vast amount of hurdles that I had to overcome due to unpredictable behaviour of custom offices and poor express courier service (not Dragon Laser's fault, and a peculiar Italian feature!). And in these cases, also, their assurance of "delivery or cash back, no questions asked" was essential for peace of mind.